Unpasteurized, Unfiltered, Bottle-Refermented Belgian Ale. The Brasserie Des Légendes is housed in a medieval castle in the town of Irchonwelz, in the French-speaking south of Belgium. Its majestic gate stands high to allow the passage of the occasional visiting giant ... as the town is famous for its annual giants parade. This beer pours slightly cloudy dark amber almost brown with an off white head. Rich sweet caramel malts on the nose, along with very pleasant aromas of Christmas spices, all with that classic yeasty Belgian background. It’s one of those beers that you just can’t wait to dive into; well, if you’re a fan of Belgians like I am. I just hope it tastes as good as it smells. That is a very nice tasting Christmas Bier. The taste starts out with sweet caramel malts upfront, then a rich effervescence but more of a creamy effect then a cleansing one. Next just before the swallow you get those rich Belgian spices and yeasty notes. The finish is sweet caramel malts with a lingering Christmas spices. You are left with a caramel malt coating in your mouth. Not quite as like the roasted malts of a stout but a lingering coating none the less. This is fuller bodied beer then it looks. As this brew warms a little you can really start to pick up the Belgian yeasty funk; sweet, yeasty and somewhat sour. 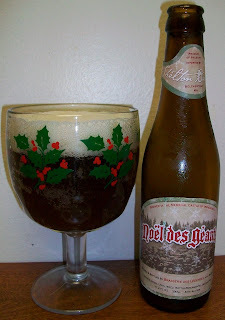 This was a very nice surprise; what a nice Christmas Beer. I forgot to talk about the head. It did diminish to a pretty thick layer on top of the beer. It pretty much stuck around to the very end. I really enjoyed this beer. I was just one of those impulse buy’s that come home to the house one night. This is a very good Belgian Ale. I can only assume because of the spiciness that Beeradvocate classifies this as a Herbed / Spiced Beer. At 8.5% I would suggest a category of a Belgian Strong Dark. To me it’s a good Belgian first with some spices. All and all this is a solid B for me. I recommend this beer to anyone that likes the Belgian styles of a Strong Dark or Abby Dubbel.